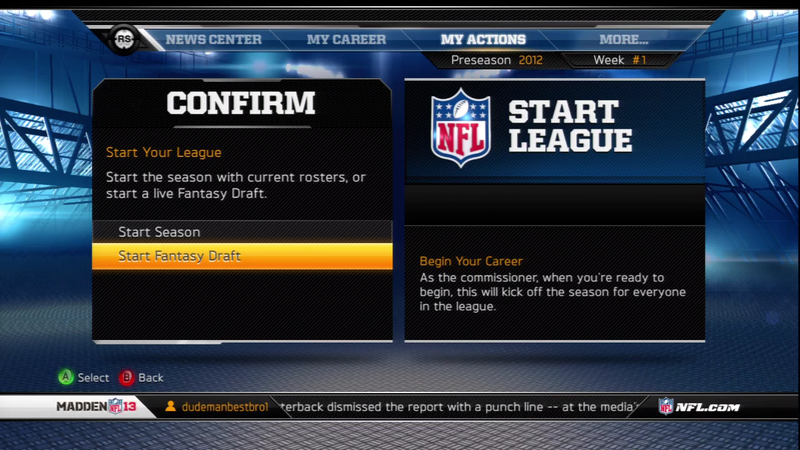 A server-side update has returned the fantasy-draft option to Madden NFL under its new Connected Careers mode, but only for online leagues. Still, anyone present in a league before it begins is able to participate in a draft of all of the NFL's active talent, remaking and rebalancing each of the NFL's 32 franchises. Fantasy Draft was originally tossed out when EA Sports developed "Connected Careers," which unified the game's Franchise and Superstar modes into the same structure, allowing those who control single players to play games against entire teams controlled by human opponents. The prolonged outcry over the loss of Fantasy Draft evidently pushed EA Sports to reincorporate it, though for now it is only restored to Online Connected Careers. Those playing offline connected careers must evidently wait on a patch. To access fantasy draft, start a new Connected Careers league as a coach, and wait for anyone else you want to play with to join. Then, when it comes time to select the "Start League" option from the "My Actions" menu in the preseason, the league's commissioner will be presented with the opportunity of beginning the season with the rosters already in place or starting a fantasy draft. In a draft, every human player will have 45 seconds to make a selection, and can fill up to 54 slots on the team (meaning at least one draftee must be cut in pre-season). The draft may be simulated from any point once all participants are done selecting the positions that matter most to them. Player salaries will be normalized and valued on the basis of the round in which they were drafted, to put every franchise on an even playing field for salary cap purposes. No word yet on when this feature will be restored to Offline Connected Careers. For those who are still curious about the means to edit player appearances in Connected Careers, EA Sports said the Madden development team is "currently exploring the potential option to include additional functionality in Madden NFL 13 in an upcoming title update."